There is about a week in between our pastry courses, and we really don’t get to bake together all that frequently, so we planned to tackle a couple other baking projects. 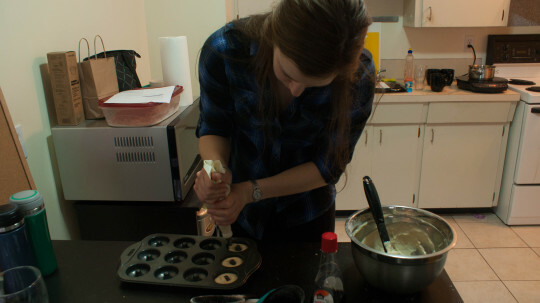 Roopa recently got a mini-doughnut pan so this was the perfect opportunity to try it out! There are several doughnut recipes on Sprinkle Bakes, one of our favourite baking blogs. We picked one specifically for mini-doughnuts. Preheat oven to 425F, and grease a mini doughnut pan with shortening. Add buttermilk, vanilla, egg, and butter, and mix until just combined. Using a piping bag, fill each cavity ½ – 2/3 full. Bake for ~5 minutes until the tops spring back. 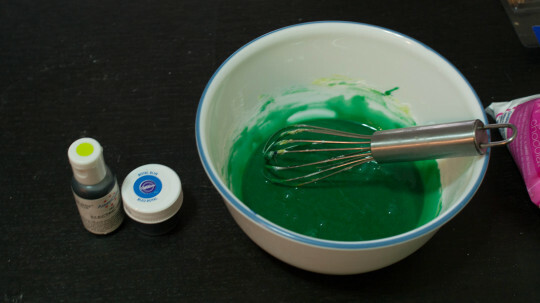 Whisk all ingredients together in a bowl until well combined. Add icing sugar/milk to get the desired consistency. 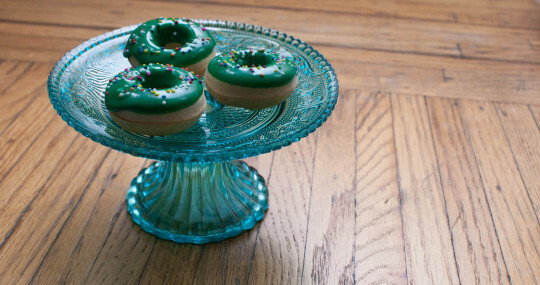 When doughnuts are cool, dip the bottoms in the glaze and cover in sprinkles.